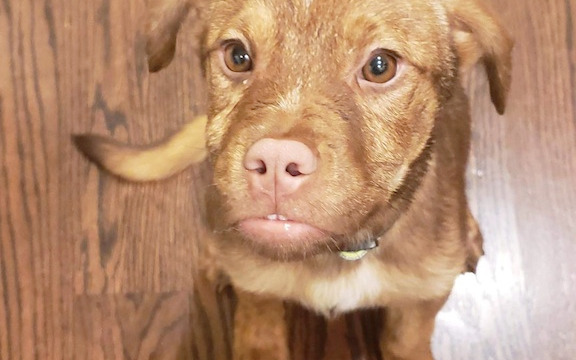 Rusty should be a happy, playful 4 month old puppy. Sadly, he was born with a liver shunt, a congenital defect that could end his life before he reaches a year. His only help is potential surgery, and in order for that to happen, we need to raise enough money to cover the costs. The wonderful people at St. Nick's Closet, a 501 (c)(3) charity have offered to help, but their cupboard is pretty bare right now, and we need to help them raise the rest of Rusty's funding. Please, donate whatever you can. It will go directly to St. Nick's to take care of Rusty. Let's get this sweet little guy healthy so he can go on to find his forever home and his happily ever after. All donations are tax deductible. I met this little guy in Macon and he's such a sweetie who deserves a spoiled life!